6" x 9" flexible nonwoven hand pads impregnated with abrasive grain. Use hand-held, attached to a rigid plastic holder, or on high speed vibrating sanders. 60 pads per box. $1.00 each list price. 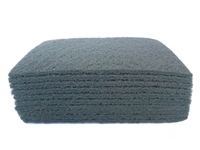 If you don't see the abrasive products you are looking for, please email customer service at info@shop4grit.com or contact your sales rep for more information.